If you are in the process of searching for a party bus in Flint, then rest assured that you have finally managed to find exactly what you are looking for. Here at Rockstarz Limousine and Party Bus, we not only deliver a quality product via our excellent customer service, but you can rest assured that you and your guests will have an amazing time. When you want to rent a party bus, it makes sense that you will be concerned about a number of things, one of which will be the number of people you can invite. To make life easier, we have tried to make the best possible use of the space on our bus to then allow you to have even more guests than ever before. 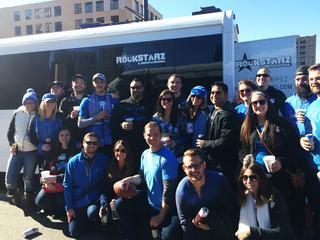 Our Flint party bus rental service is designed to provide you and your guests with the best time possible, and we achieve that from the moment that you all set foot on the bus. When you do so, you will be immediately transported into what amounts to your own personal nightclub for you to then cruise around the city. From the sound system, to the comfortable leather chairs, and not forgetting the light display, this is a bus unlike any other. Previously, individuals have used our Flint party bus service to help celebrate a number of different occasions. From a birthday, to a special anniversary, or even a graduation party then we can help. Alternatively, you may just want a space for you and your friends to have a good time, and if so then give us a call. So, if you live in the Flint area and are looking for a party bus, then call us here at Rockstarz Limousine and Party Bus. The other option is to contact us via our website and someone from our team will be in touch as soon as possible to discuss your individual requirements.